wedding galleries that each cake we make takes into consideration the couples individual instructions for their cake. to book a free consultation. This is so you can discuss your requirements for your cake at your leisure and in greater detail. You don't need to rush the process and a consultation allows you to taste the cakes (so you know what you like) and it can save you money, time and stress. If you are happy with the quotation, a £50 deposit secures your date in the work diary and your balance payment can be made on your viewing night (yes you see your cake before delivery) and we can then arrange delivery to your venue for a small fee or you can collect your cake yourself if you prefer at no cost. We have found that this service has been greatly appreciated by our customers. 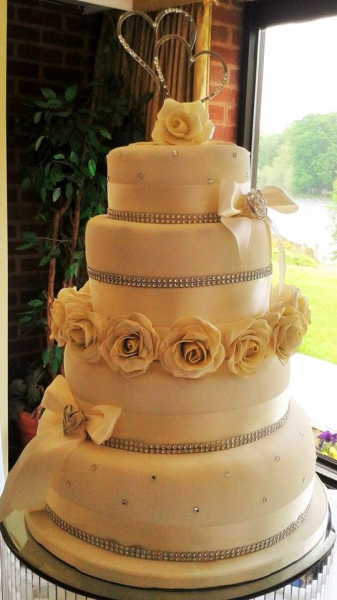 We don't have any clever gimmicks, or hidden costs, we just simply offer to make the best quality wedding cake we can for your celebration and provide you with a quality product which is good value for money. Always mention at your consultation if there is a budget we need to be respectful of. It is disappointing when you find a design that you love when it maybe outside of your budget. Consultations enable us to discuss a variety of ways to help you have the cake of your dreams without breaking the bank, so the golden rule is 'always ask'. We often get telephone calls asking for prices for cakes without people coming for a consultation. For these queries I can only give rough guides for this as we haven't had the opportunity to sit down and discuss the design of the cake in great detail. For cakes we have already made you will find a price in the cake galleries. All of the cakes can be made larger or smaller then those shown in the picture and prices can be adjusted accordingly. 2 Tier Stacked Cakes are available in many sizes so we usually price these up on application depending on the size you require. If you choose a more traditional Cake, Crystal Spiked Pillars come in a choice of 7 and 9 inches and will be included in your quotation. Alternatively you can choose a chrome stand. You will find more details of stands for hire costs on our About Us page. Anything over 4 tiers will be priced on request. There are many reasons why a couple may find themselves working to a fixed budget for their wedding. Over the years I have worked with many lovely couples who have found themselves having to make difficult choices about what they can have for their wedding and deciding what they will have to leave out, especially if they are paying for their wedding themselves. Some couples think they may not have enough money to have a cake, but we can ALWAYS find a way to help them have a cake for their special day. or failing that you can even hire one of our dummy cakes for your photos and just have slab cakes to serve at your wedding. Always tell us when ringing if there is a budget that you want to be respectful of and we can then give you the best advice to get a fabulous cake. There are always solutions to problems. You just have to ask!! !